A very disturbing photo and news is making the rounds on social media. A man identified as Raymond Boabey attempted to kill his girlfriend on Christmas day because she served him only one piece of meat. According to Kasapa FMOnline, Theodora Ansah narrowly escaped death after her lover whom she lived with slit her throat with a machete. The incident occurred in Ghana. 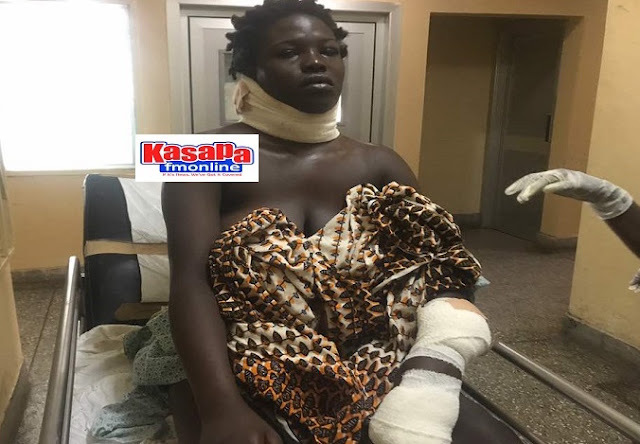 Story is Theodora an 18-year-old mother of two had a fight with her boyfriend over a piece of meat she served him. Theodora said she didn't have enough to prepare her Christmas meal so she served him rice with one piece of meat which angered her boyfriend. So he confronted her angrily and slapped her in the process then kicked her out of his home. On Thursday, 28th Decembers, he visited the lady to apologise then asked her to let him go home with her daughter which she obliged. Hours later she went back for her daughter and he requested to have a chat which she agreed. She added that he requested that they come back together and plan their marriage which she refused. 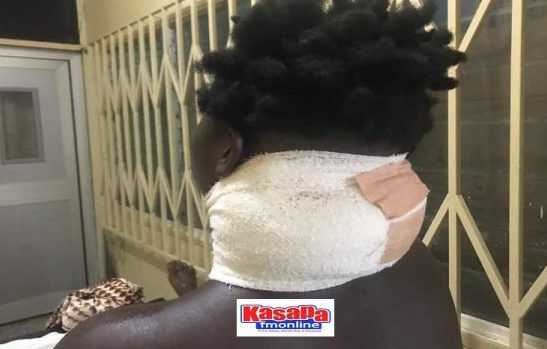 Her response infuriated him so he got a cutlass and slashed her neck from behind, the cut also affected her left hand which she used to block the cutlass. Theodora who is currently on admission at the Korle Bu Teaching Hospital said, this is the third he would be attacking her since they started dating.